Looking to get away this year? There are countless cruises available to make your dreams come true. Whether you’re in the mood for a tropical island getaway, a romantic journey along a beautiful stretch of coastline, or something even more adventurous like a trip to Alaska, cruises can meet all of your needs and provide some magical memories. In addition, they also happen to be highly accessible and flexible, with cruises of different lengths available to suit every budget. There are plenty of affordable cruises in October, as well as more expensive options to suit those who have the extra cash to spend on a more lengthy or luxurious trip. Either way, you’ll find a lot of good cruise options available at this time of year, with various unique routes available, including repositioning cruises as the ships start to prepare for the winter season ahead. If you’re thinking of booking a cruise in October, read on to learn about a few of the best options available to you and start planning your dream getaway today. Head off on the adventure of a lifetime this October with the '8 Night Eastern Caribbean' cruise from Carnival. At a time when the weather is getting cooler and the days are growing darker for many places, the Caribbean is the ultimate getaway destination. The sun never stops shining around the Caribbean, the beaches are always wonderful, and the waters are always warm, and you can see and enjoy all of that on this amazing cruise. The '8 Night Eastern Caribbean' October cruise takes place on the Carnival Mardi Gras. One of the newest ships in the Carnival fleet, the Mardi Gras is a lively ship with a lot of personality and fun features to be found on board. You'll find all of the classic Carnival facilities and amenities like top tier restaurants, amazing live shows, excellent spa treatments, super fun and games for the kids, and more, as well as a host of unique features exclusive to the state-of-the-art Mardi Gras. This October Caribbean cruise leaves from Port Canaveral in Florida and makes a total of four stops in four different destinations all over the Eastern Caribbean. The first stop is Grand Turk Island in the Turks and Caicos Islands. There, you'll get your first big taste of island life and be able to check out some of the white sands and turquoise waters the Caribbean is so famous for. Next, you'll visit the beautiful Dominican Republic as you arrive at Amber Cover, and then you'll get to explore the vibrant island of Puerto Rico and visit the capital of San Juan. Finally, your last stop on this Caribbean cruise will take you to St Thomas in the United States Virgin Islands for more wonderful fun in the sun. One of the most popular cruises to run every October is the '3 Night Bahamas' cruise from Royal Caribbean. This super cruise lets you see what it's like to travel with one of the best cruise lines in the business for a long weekend of enjoyment and excitement around the beautiful Bahamas. This is also one of the most affordable cruises in October due to its short length, and it all takes place on board the Navigator of the Seas. A stunning vessel that was designed with a lot of expertise, passion, and attention to detail, the Navigator of the Seas is a floating city like no other. It features incredible amenities and really stands out for offering some of the best staterooms and suites you could ever hope to find on a contemporary cruise ship. Decorated and furnished to the highest standards, complete with large windows and sometimes balconies to really let you appreciate the views, the rooms on board this Royal Caribbean ship are breathtaking. This October cruise sets off from Miami in Florida and makes two stops over the course of its 3 night journey, so you'll really get a lot of value out of this cruise. The first stop is at Coco Cay, also known as Little Stirrup Cay, which is a private island owned by Royal Caribbean. Only RC customers can use this island, and it's the closest most people will ever get to having their own private tropical paradise. Next, you'll visit Nassau, the capital city of the Bahamas. There, you can meet the locals, taste some authentic Caribbean cuisine, do some shopping around the markets and stores, relax on the beach, stay up late at night at the bars and clubs, and much more. The vast majority of October cruises tend to focus on the Caribbean islands and nations, but if you're looking for something a little different at this time of year, a trip to Bermuda could be a good idea. The '5 Night Bermuda' cruise is a highly popular cruise for October and very affordable too, with very cheap rooms available if you book in advance and several dates to choose from all throughout October. For this cruise, you'll be traveling on the breathtaking Adventure of the Seas. A Voyage-class vessel with amazing water slides, fun swimming pools, exciting live entertainment, top class dining facilities, relaxing lounges, comfortable bars, amazing rooms, and so much more, this ship is like a 5-star luxury resort out on the water. It's an amazing vessel and it has a lot of different facilities and features to cater to guests of all ages, so it's a good option for families, couples, friends and more. 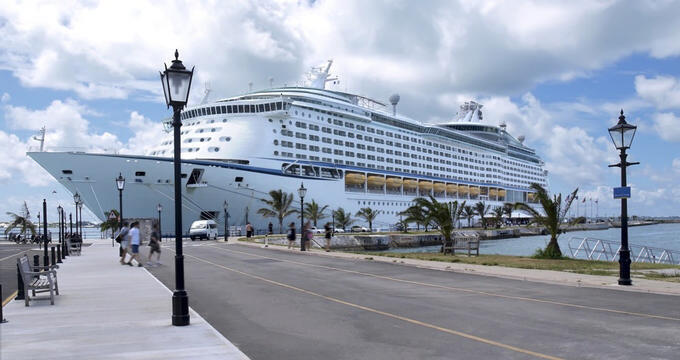 The cruise itself sets off from Bayonne, NJ, so it's a good option for people in the NYC or Philadelphia areas, and it makes just one stop at King's Wharf in Bermuda. From there, you'll be free to explore this amazing Atlantic Ocean island location, famed for its pink sand beaches, ocean view golf courses, fascinating historical landmarks, superb coral reefs teeming with marine life, and more.